Chris Richardson is a partner in the Finance & Acquisitions Department of Davis Graham & Stubbs LLP. His practice has an emphasis on mergers and acquisitions and corporate financing and restructuring work. In connection with restructuring work, Mr. Richardson has substantial experience in Chapter 11 bankruptcy matters. He has worked with secured and unsecured creditors, debtors, and creditors’ committees in numerous Chapter 11 proceedings (Standard Metals, MiniScribe, Kaiser Steel, The Shane Company, Colorado-Ute Electric Association, Formus Communications, NII Holdings, Schwinn Bicycles, Gryphon Gold, American Eagle Energy, American Standard Energy, Atna Resources, Boomerang Systems, Linn Energy, III Exploration II, and Battalion Resources, among others). He has assisted clients and debtors in buying and selling companies out of Chapter 11, as well as reorganizing or liquidating debtor companies. He has represented purchasers of oil and gas assets in Chapter 11 Section 363 auctions in bankruptcy proceeding in Wyoming, Colorado, and Delaware. Mr. Richardson’s corporate practice focuses on mergers and acquisitions and financing work, primarily in the purchase and sale of privately held companies. Many of his transactions have been in connection with leveraged buyouts and buildups of platform or portfolio companies. In addition, he has substantial experience in transactions involving oil and gas and coal companies in both the context of purchase and sale transactions as well as in day-to-day operational matters. Mr. Richardson and his team of DGS lawyers recently completed the sale of an oil and gas refinery for a long-time client of the firm. He also has significant financing experience and has recently represented venture capital groups, institutional lenders, and equity participants in loan and restructuring matters. Mr. Richardson has represented Western coal producers in various aspects of their operations. 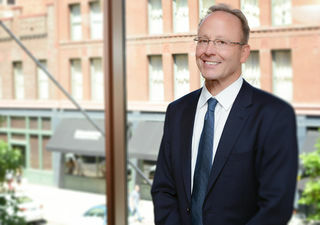 He has represented Rio Tinto Energy, Cloud Peak Energy, Anglo American Coal Company, Arch Coal, Colowyo Coal Company, Peabody Energy, Westmoreland Coal, Triton Coal Company, Vulcan Capital Management, and Montana Power in matters ranging from utility bankruptcies and preparation of long-term coal supply agreements to joint venture coal projects, major purchase and sale transactions, structured financings, and leverage lease transactions. Additionally, Mr. Richardson has represented various oil and gas companies in acquisitions and financing, including Petro-Canada (USA), Encana Oil & Gas, Resolute Energy, J.M. Huber, SM Energy, and Suncor. Mr. Richardson has lectured on acquisition agreements, deal structures, and debtor-creditor issues, including the impact of bankruptcy on environmental laws, lessor-lessee relationships in bankruptcy, bankruptcy current developments, and asset sales in a bankruptcy. Mr. Richardson has been recognized by Chambers USA as a Leader in Their Field in Corporate/M&A and has been selected for inclusion in Colorado Super Lawyers by Thomson Reuters. Additionally, he has been selected for inclusion in The Best Lawyers in America for Bankruptcy and Creditor Debtor Rights/Insolvency and Reorganization Law, Leveraged Buyouts and Private Equity Law, and Mergers and Acquisitions Law. He was also named by Best Lawyers® as the 2016 Lawyer of the Year for Bankruptcy and Creditor Debtor Rights/Insolvency and Reorganization Law in Denver.